HMD Global continues to rapidly renew its portfolio of Nokia Android smartphones by today launching Nokia 3.1 in India. Offering access to the latest Google services, such as the Google Assistant, the smartphone continues to deliver a pure, secure and up-to-date Android experience with Android One, combined with the premium craftsmanship and design expected from a Nokia smartphone and the performance to match. Nokia 3.1 goes on sale starting July 21st across India and will be available across top mobile retailers and online on Paytm Mall and Nokia.com/phones. The Nokia 3.1 runs MediaTek 6750, an octa-core chipset, giving you twice the processor cores and a 50% performance boost on the previous generation so your phone can keep up with you. Featuring an upgraded 13MP main camera with auto focus, Nokia 3.1 captures the memories that you’ll want to relive over and over. Thanks to its full set of sensors usually only found on premium phones, the Nokia 3.1 lets you make the most out of popular AR apps like Pokémon Go and capture the whole scene with panoramic imaging. 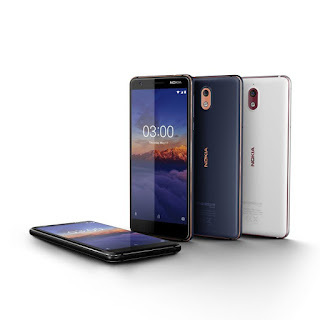 Together with Nokia 8 Sirocco, Nokia 7 plus and Nokia 6.1, the new Nokia 3.1 joins the Android One family, delivering an experience designed by Google that is smart, secure and simply amazing. Nokia smartphones with Android One offer more storage and battery life out of the box, as well as the latest AI-powered innovations from Google to help you stay ahead of the game every day. Nokia 3.1 will receive three years of monthly security patches and two years of OS updates from launch, as guaranteed in the Android One programme. This puts them among the most secure phones out there, always up to date with the latest Google services like the Google Assistant and Google Photos with free unlimited high-quality photo storage. The phone is ready for Android P.
The new Nokia 3.1 will come in three colours: Blue/Copper, Black/Chrome and White/Iron. It will be available in the storage/RAM variant of 2GB/16Gb at a recommended best buy price of INR 10,499 from 21st July across top mobile retailers. It will also be available online on Nokia.com/phones and Paytm Mall. Consumers can avail exciting offers as below. · Consumers buying Nokia 3.1 from a retail outlet by scanning the Paytm Mall QR code will get 10% cashback on recharges and bill payments on Paytm. · Consumers buying Nokia 3.1 will additionally get two INR 250 movie cashback vouchers which can be redeemed against booking minimum two movie tickets via Paytm. · Consumers using ICICI Bank Credit or Debit Card will get a 5% cashback. · Idea and Vodafone consumers will get two exciting offers. On a recharge of INR 149 pack, they will get 1GB data/day, unlimited calls and 100 SMS/day for 28 days; additionally, consumers upgrading from 2G or 3G phone to the new Nokia 3.1 will get 1GB data/day for 28 days. On a recharge of INR 595, consumers will get unlimited calls, 100 SMS/day, 18GB data for 6 months.